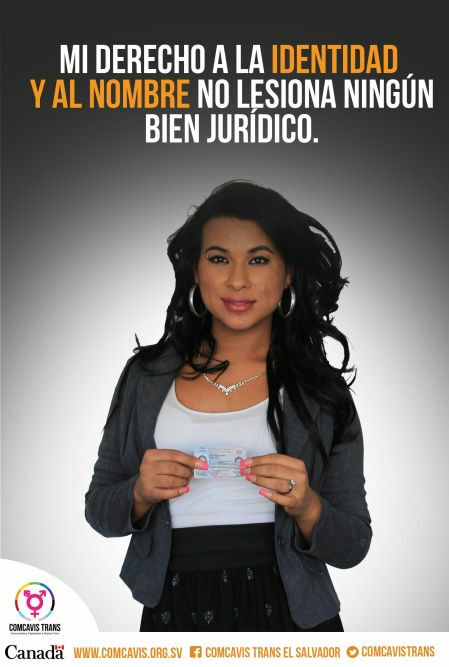 "Comunicando y Capacitando a Mujeres Trans en El Salvador" Association (COMCAVIS TRANS), with financial support from the Canadian Embassy in El Salvador, released publicly for the first time in history positively a campaign called by "The right to justice, the name and identity of transgender people". The campaign was published in different strategic points of the Salvadoran capital in order to sensitize the general population regarding the need to recognize and respect the right to identity and the name of TRANS people in El Salvador. The messages were strong and left no legal argument for the authorities and opposition authorities ordered the removal of banners in public places. Message 1: "MY RIGHT TO IDENTITY AND NAME DOES NOT HARM ANY LEGAL PROPERTY''. Message 2: "LGBTI PEOPLE DEMAND THE IMPLEMENTATION OF THE REFORM OF THE ARTs. 129 AND 155 OF THE PENAL CODE".